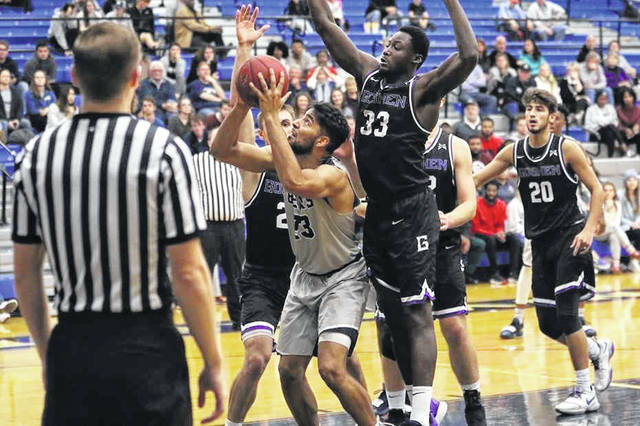 Grayson, Ky. – Shawnee State men’s basketball got back in the win column on Thursday night, defeating Hiwassee (Tenn.) 78-72 on day one of the Super 8 Classic at Kentucky Christian University’s Lusby Center. The first quarter would go back and forth, featuring six ties and 12 lead changes. The game would be tied 11-11 five minutes in before Jamesio Rhine hit a shot to put Hiwassee up 13-11. Selby Hind-Wills responded with a three two minutes later to put the Bears up 14-13, and the two teams would trade free throws and buckets until Hind-Wills again put SSU up 18-17. Hind-Wills would get another bucket to extend the Bears’ lead to 20-17, but a second chance basket by Jamal Weaver and a three from Ben Snider put Hiwassee back up 22-20. Tamal Watkins tied the game with a lay-in moments later, and Justin Johnson put the Bears up 24-22. SSU would grow that lead to as many as eight points on a pair of Michael Hubbert free throws, and lead by six at 38-32 at halftime. After Naequon Newman made a shot to cut the lead to four, Shawnee State would go on an 8-0 run, growing their lead to 46-34. SSU would hold the Tigers at bay, eventually pushing the lead to 14 on a Justin Johnson basket, leading 52-38. The double-digit lead would not last as Hiwassee rallied, scoring eight straight points to cut the lead to 52-46. SSU would get the lead back out to 10 points at 61-51, but another seven straight points from Hiwassee, capped by a three from Jamal Weaver, cut the lead to one possession at 61-58. The lead would stay single digit the rest of the way, with the Tigers tying the game at 70-70 with 3:11 to go as Naequon Newman hit a three. Shawnee State would turn things around to take back the lead late. Tim Biakapia would get a second chance lay-in to give the Bears back a 72-70 lead, getting fouled by Jamal Weaver on the play and hitting the free throw to put the Bears up three. Hind-Wills split a pair of free throws to make the lead 74-70. Bryant Bernard hit a shot with 1:34 to cut the lead to two points, but that would be the last score for Hiwassee. Biakapia would seal the game with lay-ups to give Shawnee State a 78-72 win. Selby Hind-Wills had 12 points to lead Shawnee State. Tim Biakapia had 11 points, while Juwan Grant and Justin Johnson each had 10 points. Jamal Weaver had a game-high 19 points for Hiwassee. Ben Snider had 14 and Bryant Bernard had 12. The win sees Shawnee State improve to 5-3 on the season. Hiwassee falls to 5-6 with the loss. Shawnee State now leads the all-time series 1-0. Shawnee State men’s basketball returns to action on Friday, November 30 when they take on Grace Christian (Mich.) on day two of the Super 8 Classic. Tipoff is set for 4:00pm.